Composers often speak to us more intimately through ttheir chamber music than through their larger scale orchestral works. 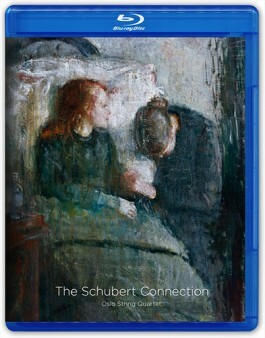 Case in point, 2L’s The Schubert Connection. At face value, there would appear to be little in common between Franz Schubert’s Quartet No. 14 (“Death and the Maiden”) and Edvard Grieg’s only completed string quartet, written a half century later. However, the liner notes by Oynstein Sonstad, cellist of the Oslo String Quartet who perform these works, points out the considerable parallels between them. Both works are set in minor keys, often associated with somber moods, and feature technical and tempo similarities in their four movements. Also, both composers incorporated elements of their earlier songs as well as local folk songs into some of these works’ themes. The Schubert piece is much better known and presents the composer’s personal reflections on death as he grew increasingly aware that he had contracted an illness that would eventually be fatal. This quartet has few rays of sunlight and, in spite, of the final Presto, leaves the listener’s heart heavier than it was at the beginning. Grieg’s quartet also opens in the gloom of night but offers a bit more cheer with the infectious local melodies that were his trademark and perhaps detracted from the seriousness of his other compositions. The Oslo String Quartet, consisting of violinists Geir Inge Lotsberg and Liv Hilde Klokk, violist Are Sandbaken, and cellist Sonstad, has concertized extensively during the 22 years of its existence. The ensemble playing is spotless and bears the fruit of such close and long-term collaboration. The individual talents of these players come to the fore in the tricky, fast paced finales of each quartet with demands that would surely vex lesser musicians. The beauty of string quartet recordings is the listener’s ability to pick up each of the voices distinctly in a good recording. The original recording was a 352.8kHz/24-bit DXD master down-sampled as 5.1 DTS-HD Master Audio or 2-channel LPCM at 192kHz/24-bits. Both are excellent renditions although the former gives you much more of the ambience of the Sofienberg Church. The rating is based on the additional high-resolution multi-channel SACD and the other audio formats (mShuttle Pure Audio as noted in the introductory disc data). The enclosed program booklet nicely details the contents of each quartet as well as background information on the composer and his inspiration. For chamber music lovers, this is a disc to be treasured. Superb musicians tackling two masterful string quartets is indeed a welcome event. The terrific sonics that give listeners the warmth of bow on strings over resonant wood convey how these instruments should sound. The Schubert quartet is one of my favorites, while I have only heard the Grieg once before. Given the deeply felt performances given to the latter, I will certainly return to it more often. The 2L label has simply done it again!